This is the first Dutch edition of A Thief of Time, published in 1898 by Utigeverij BZZTôH in 's-Gravenhage, or in English Hague, in the Netherlands. This edition is a special crime novel denoted by the BZZTôH-Crime on the spine and front cover. 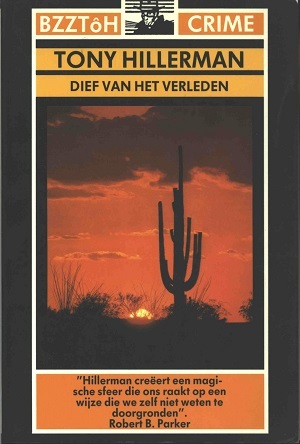 The text was translated from Tony Hillerman's original English to dutch by Wiebe Buddingh'. The cover photograph design is by Tokkio synd and depicts a scene of a setting sun with a Saguaro cactus in the foreground. There is also a blurb from Robert B. Parker, a famous American crime novelist, on the cover praising Hillerman's work. Format: Paperback, 20 x 13.5 cm. Binding: Full-color paper covers with the publsiher's lgoo, author, title and BZZTôH-Crime printed vertically on the spine.